Our Hollywood heavy hitters are coming! 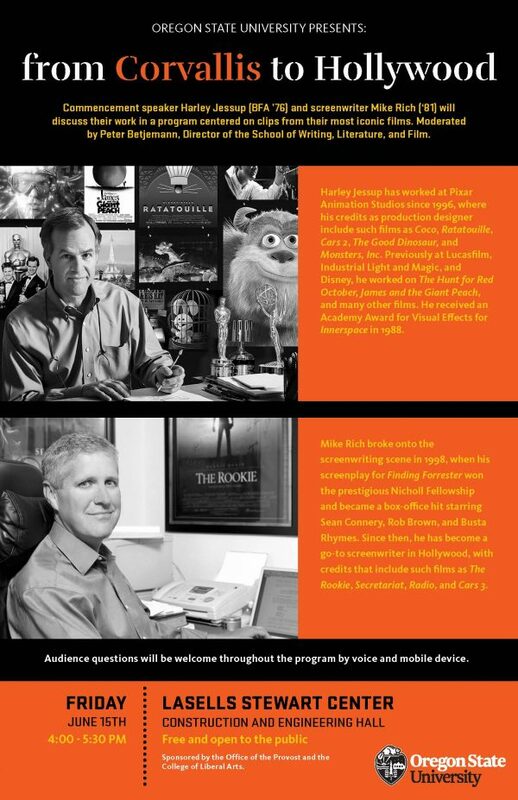 Our Hollywood heavy hitters are coming ― the Office of the Provost and the College of Liberal Arts welcome you to a bonus appearance from commencement speaker Harley Jessup (BFA ’76) and screenwriter Mike Rich (‘81). Friday, June 15 @ LaSells. Facebook event page. Commencement speaker Harley Jessup (BFA ’76) and screenwriter Mike Rich (‘81) will discuss their work in a program centered on clips from their most iconic films. Moderated by Peter Betjemann, Director of the School of Writing, Literature, and Film. Harley Jessup has worked at Pixar Animation Studios since 1996, where his credits as production designer include such films as Coco, Ratatouille, Cars 2, The Good Dinosaur, and Monsters, Inc. Previously at Lucasfilm, Industrial Light and Magic, and Disney, he worked on The Hunt for Red October, James and the Giant Peach, and many other films. He received an Academy Award for Visual Effects for Innerspace in 1988. Mike Rich broke onto the screenwriting scene in 1998, when his screenplay for Finding Forrester won the prestigious Nicholl Fellowship and became a box-office hit starring Sean Connery, Rob Brown, and Busta Rhymes. Since then, he has become a go-to screenwriter in Hollywood, with credits that include such films as The Rookie, Secretariat, Radio, and Cars 3. Audience questions will be welcome throughout the program by voice and mobile device. Sponsored by the Office of the Provost and the College of Liberal Arts. Posted in Career Success Center, Uncategorized. © 2019 College of Business, all rights reserved.